Freedom's Wings Canada has formed a strategic partnership with local agencies and therapeutic recreation professionals to enhance the lives of persons living with disabilities through leisure activity. It is making the most of the abilities you possess thus enhancing the quality of life. It allows the individual to gain knowledge, learn new skills and challenge themselves to the fullest of their potential. Who Benefits from Therapeutic Recreation? People with physical or developmental disabilities and people who are living with chronic and life threatening illness benefit. Youth at risk may also benefit. In short, anyone who could get more out of life but needs support to do so. How does Therapeutic Therapy help? Therapeutic Recreation helps rehabilitate and increase functioning and independence as well as reduce the emotional effects of illness or disability. Therapeutic Recreation can improve physical abilities, help individuals set goals, promote confidence and greater self reliance, manage stress, and strengthen relationships and interpersonal skills. At the same time as enriching the quality of life. TR provides a wider support system and allows disabled persons to connect and share friendship and information. It reduces the sense of isolation often experienced by persons with disabilities Successes can be shared with family allowing them to become part of the experience and educate them as to how much is possible. How Does Freedom's Wings Provide Therapeutic Recreation? For some the simple experience of soaring above the ground free of the stresses and confines of daily life provides an uplifting benefit that lasts well beyond the flight. We refer to these as Inspiration Flights. 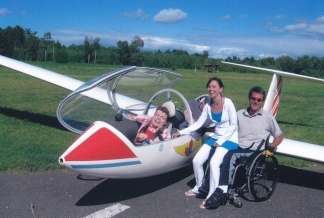 Freedom's Wings provides disabled persons with hundreds of flights annually across Canada at Soaring Association of Canada recognized clubs. Flights are at no cost to the individual. Piloting a glider requires knowledge and some physical ability. For those who have the necessary upper body control and good eyesight flight training is available with the aid of a "Rudder Stick" that duplicates the control inputs of the rudder pedals. Those individuals who are able to demonstrate sufficient strength and coordination in the hands and arms may be approved by a civil aviation medical examiner to hold a medical certificate sufficient for licensing as a glider pilot. Flight instruction is available at many of the Freedom's Wings Chapters. Federally licensed flight instructors volunteer their time and experience. Much less expensive than power flight the cost to the individual student varies by location. In some locations education bursaries may help defray the cost.